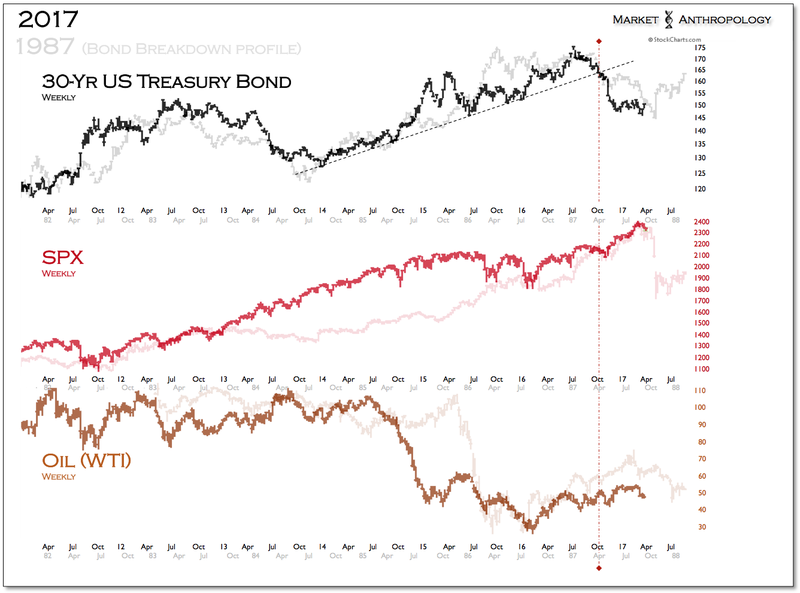 Most of the observations we’ve noted over the past year, with respect to similarities with market conditions in 1987, have been from a comparative perspective with long-term Treasuries. In hindsight, you could see this directly derivative of our thoughts on the collapse in oil prices that began in the back half of 2014, that from a relative performance point of view had few market parallels – the closest of which now appears to be the major supply-driven decline in 1985-1986 that took over 60 percent off the price of oil, as the global economy slowed while supplies remained robust. That said – and as frequently the case with looking back at nearly all market history, there are significant macro differences between the two periods, likely resulting in vastly different long-term outcomes. 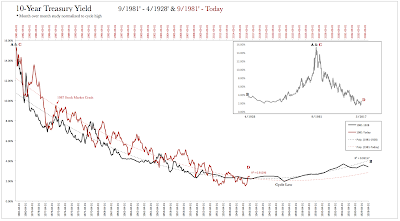 The breakdown in the oil market at the end of 1985 coincided with already broadly disinflationary market conditions, as the bond market had rallied from July 1984, out of the retest of the secular lows from the fall of 1981. 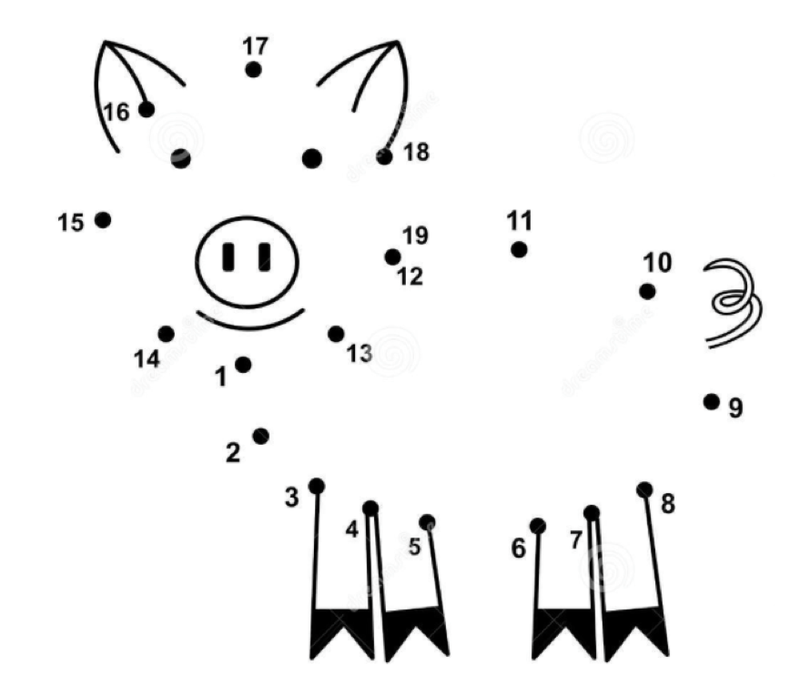 Technically speaking, what happened next was also quite significant. When oil prices began to crash in December 1985, inflation expectations declined as Treasuries broke out above the previous highs at the end of 1982. 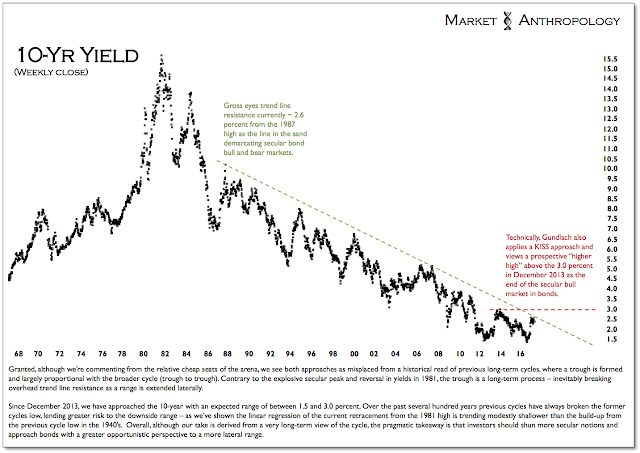 Looking back, this marked a major sea change in the markets with respect towards yields, as long-term Treasuries recorded their first “higher high” in the markets in decades. Fundamentally, this was a major benevolent force now supporting equity investors and a headwind towards commodities, as market participants gained greater confidence that inflation expectations were receding from the historic highs at the beginning of the decade. Generally speaking, declining yields and diminishing inflation supports growth as corporations can reduce financing costs, while also broadly boosting private consumption as the cost of living becomes cheaper. Downstream, the net effect is often quite positive towards equities by raising price/earning multiples. Considering this was occurring directly on the backside of the largest secular rise in yields in centuries, the infancy of the longest and strongest bull market in equities in history is quite understandable today. This is also why in as much as there have been certain intermarket similarities with the disinflationary and reflationary sub-cycles of the mid-to-late 1980’s, longer-term, the markets current disposition within the trough of the long-term yield cycle will likely result in materially different outcomes. Simply put, we currently lack the positive potential energy of a continuation of the secular disinflationary downtrend that fostered the greatest bull market in equities in history. From our perspective, the most probable macro outcomes over the next chapter in the markets will either be through muddled stagflationary growth (our bet) – or another scare with deflation. 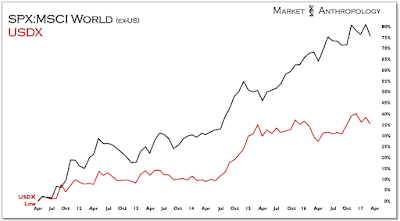 This thesis basically falls on the future prospects of the US dollar, whose continuation higher from here would likely cause widespread concerns, as inflation expectations could collapse again with less room available globally for central banks to mitigate. Headed into 1987, the Fed began moving towards tightening monetary policy as conditions domestically and in the global economy had improved. And although equities had benefited for years from the benevolent disinflationary economic shift, the uptick in economic confidence and reassurance by Fed action manifested with a powerful reflationary move across equities and previously collapsed commodity markets, like oil. At the same time, it also precipitated a large sell-off in Treasuries that had benefited for years as inflation expectations declined from secular highs. The net effect saw equities rally more than 20 percent over three months as one of the greatest bull markets in long-term Treasuries abruptly came to an end. 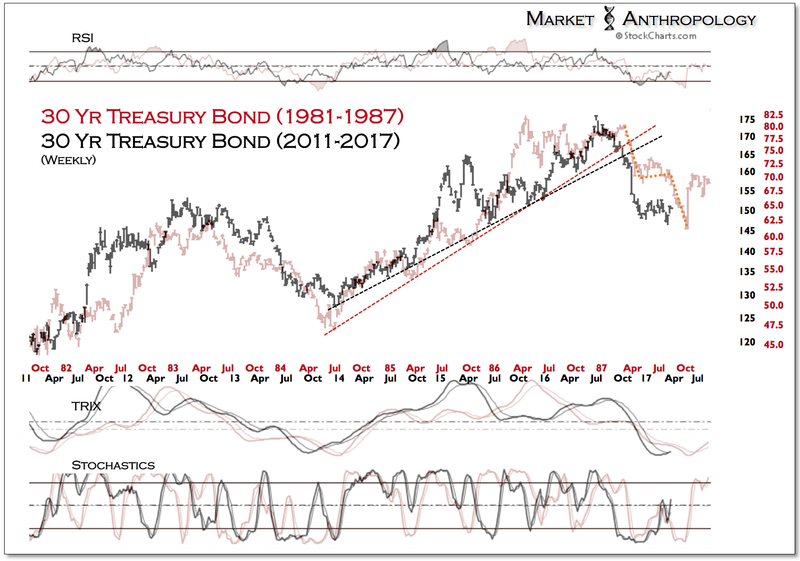 Long-term Treasuries would eventually retrace all the way back to the previous highs from 1983 and find support as the equity markets broke down in the fall of 1987. When the dust settled, the large reflationary blow-off enjoyed by equities over the past year was completely retraced. However, the respective long-term secular bull markets in bonds – as well as equities, quickly resumed momentum higher into 1988. 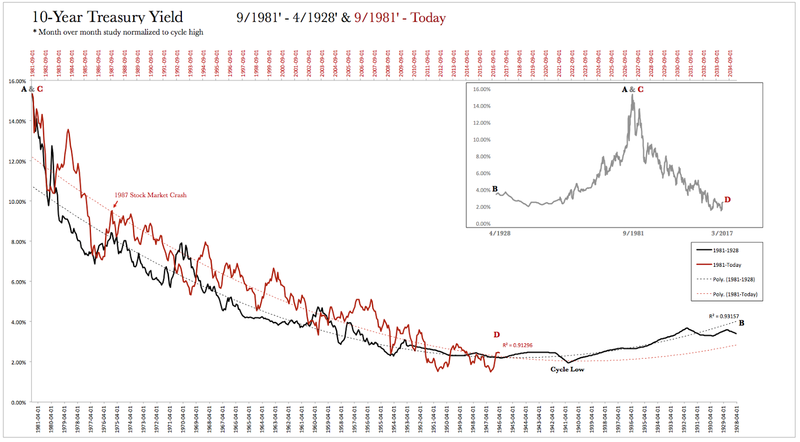 Over the past few years there have existed certain intermarket similarities with the disinflationary collapse in oil and yields in 1985/1986 and the strong and broad-based reflationary move that followed, as the global economy stabilized and the Fed began tightening in 1987. Consequently, trends across markets; namely, in equities, Treasuries and commodities have expressed a certain historical likeness, as current economic conditions in the US and globally have improved over the past year, corresponding with a strong reflationary rally across equities and commodities and a deep sell-off in Treasuries, as the Fed has moved to tighten monetary policy. Where we believe the markets stand today, is near – or directly past the peak of where classic animal spirits have pushed equities and highly speculative commodities – like oil, probably too high and too fast. When it comes to US equities, we still believe there is much greater risk at current valuations, that cyclically speaking, the bull market has exceedingly ephemeral motivations. 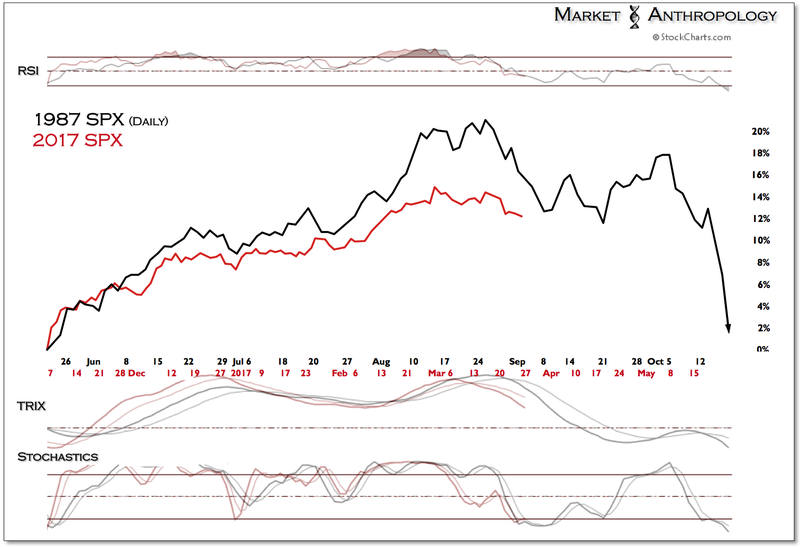 Although the unique conditions that helped precipitate the crash in 1987 will almost certainly not repeat again, we do at the very least expect a complete retracement of the large reflationary rally in US equities that had manifested over the past year as economic conditions improved. Moreover, where we suspect market histories to diverge is over the intermediate to long-term, where the outperformance by US equities today has run commensurate with strength in the US dollar, which we believe is in the process of breaking down from a cyclical high (see Here). 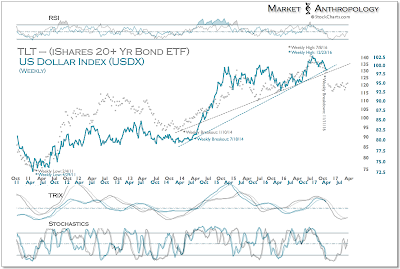 From an intermarket perspective, we view the breakdown in Treasuries last fall as both a significant contributing factor for the final push higher beneath stocks and a leading signal that the uptrend in the dollar – as well as equities, were poised to follow suit lower this year. Besides the significant distinction of where the markets sit within the long-term yield cycle that helped create an even stronger move in Treasuries and equities in 1986 and 1987, respectively – the disposition of the US dollar today is contrary to where it traded through the disinflationary and reflationary sub-cycles of the mid to late 1980’s. Back then, the dollar index had peaked at its secular high in Q1 1985, and declined for nearly 3 years until directly after the stock market crash in December 1987. 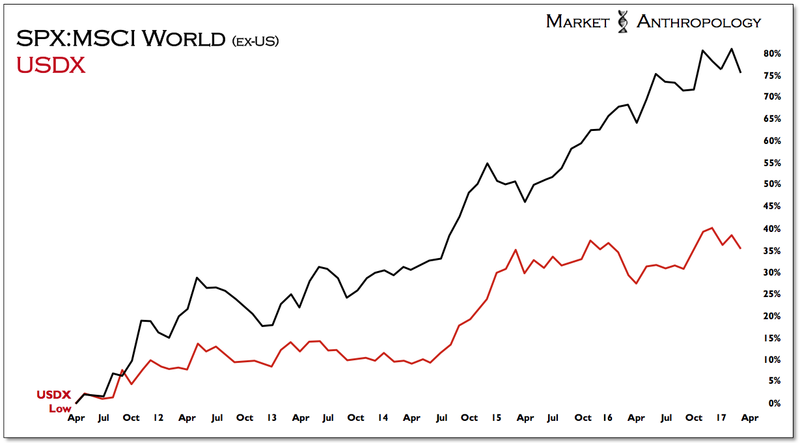 Following the crash, the dollar traded higher for much of the next 2 years with the equity markets. Today, the dollar has trended inverse to that period, with the large leg higher occurring in the back half of 2014 as oil and yields broke down. Looking back a bit further, the dollar bottomed-out in April 2011, which closely corresponded with outperformance by US equities since then and a leading proxy to short-term yields. Although the economic data over the past year has markedly improved, the markets characteristically jumped ahead of the hard economic data, with sentiment surveys remaining at or near multi-year highs – while realized figures on retail sales, housing, and construction and manufacturing have been considerably less exemplary (See NY Fed vs. Atlanta Fed and Here). 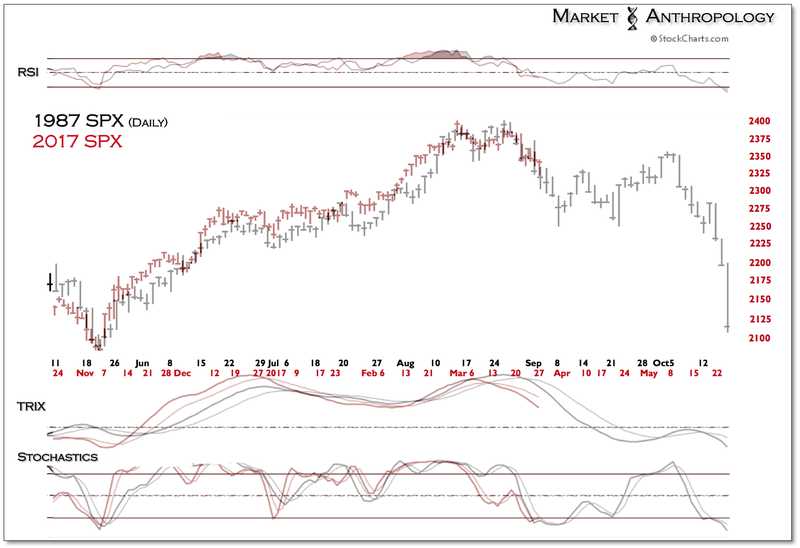 Our read of the intermarket tea leaves suggests that the continued weakness in the US dollar this year and the most recent collapse in the more speculative macro corners of the markets (like oil), more likely points towards a disappointing resolution between the hard and soft economic data series, lower nominal and real yields and a likely exhaustion of the broad-based reflationary move. 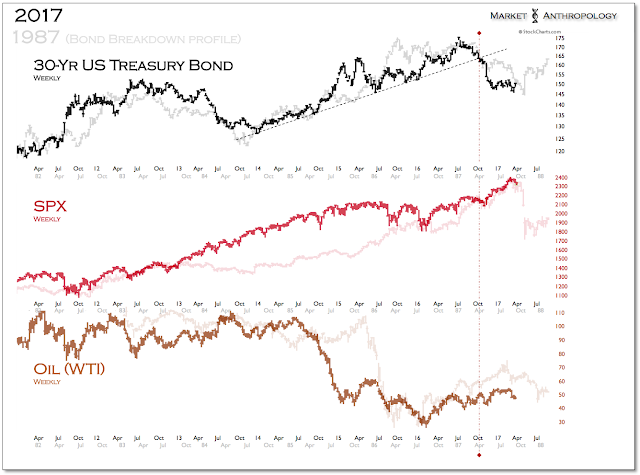 Moreover, using the retracement decline in long-term Treasuries into the fall of 1987 as a guide towards where they found support with the breakdown in equities, long-term Treasuries have already met a similar retracement pattern directly beneath the previous highs from 2012. 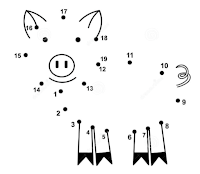 Connecting the dots even further, the overhead resistance in longer-term yields – extending from the pre-crash 1987 highs, has to-date managed to provide resistance for the current move. That said - and as we've commented on in earlier notes (see Here), unlike Gross and Gundlach's respective KISS approaches, we're less inclined to give technical secular criteria to a bear market in bonds today, primarily due to our bearings within the trough of the long-term yield cycle, which inevitably will break the overhead trend line resistance as the range is further extended laterally. Consequently, should Treasuries follow the structure of the 1987 A-B-C decline, the final leg lower could cause yields to briefly break above the trend line resistance extending from the 87' high. 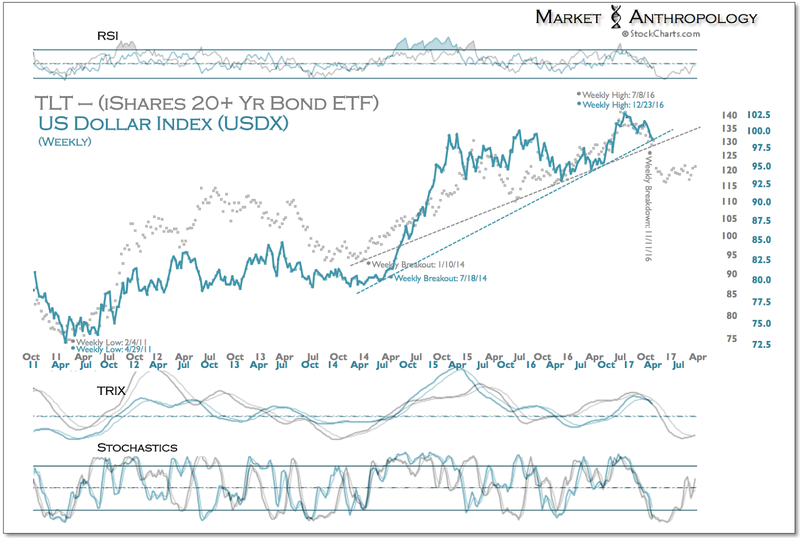 Taking into account that market positioning in long-term Treasuries remains historically crowded on the short-side, while highly reversionary economic sentiment measures persists near multi-year highs – we wouldn't recommend a speculative position today and still prefer to be short US equities over the intermediate-term. Although we firmly do not expect equities to crash along commensurate lines with 1987 and only use comparative charts for possible touchstones with current momentum, the structure and relative strength signatures of the last moves have correlated, albeit faster and stronger in 1987. 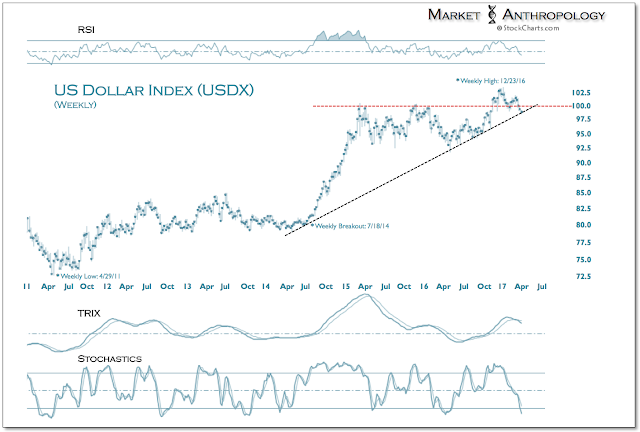 After starting the week nearly 0.5 percent lower, the US dollar index currently resides on trend line support extending from the July 2014 breakout. Should the index follow the leading breakdown pattern in bonds, we would estimate that the dollar will have a shallow bounce next week, before breaking below trend line support sometime in April.